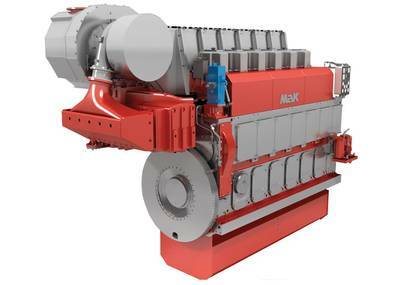 Finning Power Systems (Finning) announced the availability of the MaK M 25 E and M 32 E engines, for the global marine industry. Finning Power Systems (Finning), the dealer of MaK engines in the UK, Panama and Central America, is now offering the MaK M 25 E and M 32 E engine. Suitable for use in offshore and coastal cargo vessels, the MaK 25 E could help to save up to 40 tons of fuel per year when operating at variable engine speed, depending on the specific installation and application, the manufacturer said. Developed to be compatible with both traditional and modern mechanical systems as well as electric propulsion systems, the M 25 E is available in six, eight and nine cylinder configurations, offering ratings between 2,100 kW and 3,150 kW at 720 and 750 rpm. Vessels typically operating at lower loads can save up to 60 tons of fuel per year by changing the operating mode from constant to variable engine speed. The new MaK 25 E is based on the M 25 C platform. In addition to adding a 5% power increase and reducing the fuel consumption compared to the M 25 C, the M 25 E is engineered to provide synergies between the engine, vessel and propulsion system. By combining a set of technologies such as Flexible Camshaft, Waste Gate Technology and Cylinder Bypass Valve, Caterpillar engineers designed engine ratings to support varied operational profiles of vessels at lowest smoke emissions, while supporting the installation of Selective Catalytic Reduction (SCR) systems for lowest NOx emissions. The engine is suited for vessels where the hull and propeller have been optimized for lowest operational costs at cruising speeds, as well as for vessels where customers have elected to lower operational fuel costs by utilizing selected load profiles in combination with the most efficient engine speed. Equipped with the new Modular Alarm and Control System (MACS) the M 25 E also supports remote condition monitoring and diagnostic maintenance programs. The M 25 E is available in controllable pitch and fixed pitch propeller applications, as well as generator applications, and has a very high torque to speed ratio allowing operators to run their CP propellers at a reduced propeller shaft speed. This significantly increases the propulsive efficiency and lowers fuel consumption. The improved load response also makes the M 25 E an option for any demanding transient operations such as Dynamic Positioning. The MaK M 32 E is a new high performance marine diesel engine platform for the commercial marine industry based on the M 32 C engine series. The engine has a power rating of 550 kW per cylinder at 720 and 750 rpm, with total output ranging from 3,300 kW for the six-cylinder configuration to 4,950 kW for the nine-cylinder configuration. Suited for use in diesel-electric and auxiliary applications with multi-engine concepts, the M 32 E is the first in-line MaK 5 Mega Watt power solution in the 320 mm bore segment. The M 32 E is a platform to drive variable speed diesel-electric systems and can be perfectly integrated with Cat high-speed engines in mixed engine rooms. The engine features a stroke of 460 mm and has the same footprint as the M 32 C. In addition to having Heavy Fuel Oil (HFO) capability, the new M 32 E features the same lube oil consumption and maintenance intervals as the M 32 C product series. The engine is EPA Tier 2 and IMO II compliant. All engines in the MaK range are offered with Finning’s service support package. From emergency repair, to scheduled overhaul, to remote monitoring to the provision of genuine MaK spare parts, Finning offers a range of tailored maintenance packages to provide ongoing support of the customer’s investment.